News — Lumpy Ridge Brewing Co. Thank you for the press MMAC! "I've always had a passion for brewing beer," said Nick Smith owner of Lumpy Ridge Brewing Company, Estes Park's newest craft beer brewery. Nick's interest and love for brewing beer began after he spent a couple of years working for the Terra Haute Brewing Company in Indiana. "Since then, I've always had a passion for the industry. The creativity is limitless. It's always evolving," Nick said. "Once you understand the science behind it, you can do anything." He became absolutely determined to be involved with brewing beer as a business, in some capacity, ever since. "With my background in cooking, I really thought it would be more of a small brew pub somewhere," Nick said. "But an opportunity allowed me to get some equipment that would allow me to get into the manufacturing and distributing business." With the help of a few investors, friends and a personal determination, Nick was able to open Lumpy Ridge Brewing Company and is excited about distributing its beer around the state. "I've been brewing beer with my friend Nathan Weber in his basement for years," and his basement happens to be located off Devils Gulch at the base of Lumpy Ridge. "It wasn't our first choice for a business name, but it was the right name for our brewery," Nick added. Nick and Nathan have had a blast working on recipes and brewing together. "Nathan has been along for the ride with me and this brewery since its conception. He spends at least one day a week brewing with us," Nick said. Something that the duo learned early in their brewing days was that "Estes Park has a soft water content, which allows us to manipulate its profile to match water used anywhere in the world," Nick explained. "We don't have to strip our water of minerals (and other things) in order to create a beer that matches beers brewed in other countries." Nick admits that he is a lover of old world German style beers. "I'm a fan of traditional styles from all around Europe," he said. So Nick and Nathan like to start with the traditional and create. "We don't have a particular style. We are an American craft brewing company, and we can do whatever we want," according to Nick. Lumpy Ridge has developed some tasty beers that locals and visitors are enjoying since their soft opening at the end of June. Currently Lumpy Ridge Brewing Company has a German Altbier called Ogg's FM available to enjoy on draft as well as for distribution. You'll also find a Brown Ale and its Batch #3. "It's hard to name all of our beers in today's craft beer industry." Coming soon to their tap are flavors including a Kolsch called Meditating SAAZ, a stout, a citrus wheat, an I.P.A., a black I.P.A. and a doppelbock. Once the beer hits Lumpy's tap they are available to taste, to enjoy in a pint, to carry out as a growler and possibly in a keg. "We are kind of a rock-n-roll, modern art kind of brewery. We didn't want to fall into a traditional craft beer brewing mold," explained Nick of one of his business partners, Wade Johnson who took the building as a canvas and created the fun, funky, non-traditional but not unapproachable theme of the brewery. "He has had his boots on the ground with us since the beginning and has done an amazing job with making our brewery look cool." 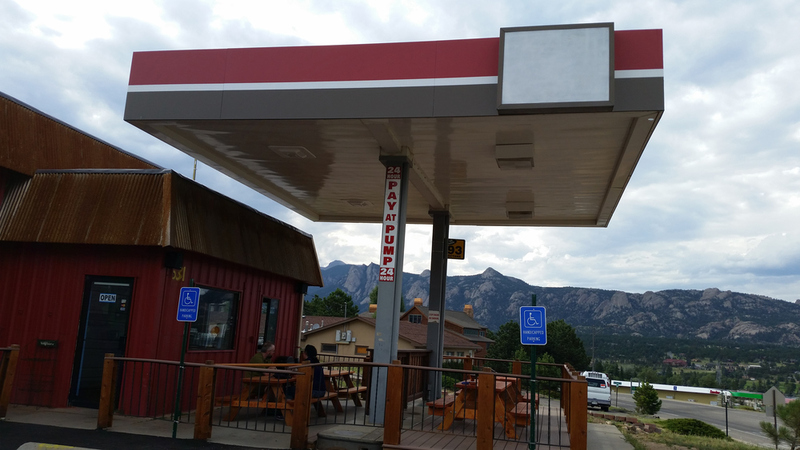 "How many tourist-friendly mountain towns have breweries made out of converted gas stations? I’m guessing the number is now exactly one. And it’s AWESOME. The porch/beer garden area is conveniently shaded by the remnants of the old pumping area. Did I mention that it’s AWESOME? I did? Well, it TOTALLY IS. While I’ve seen quite a few breweries built into odd buildings, this one ranks near the very top in terms of inventiveness and fun. Plus, it’s actually quite lovely in appearance thanks to some quirky wall paintings and lots of wood-based handiwork. ….and hell, even if the brewery itself was of questionable attractiveness, it almost wouldn’t matter with the view on hand. Yep, the mountain range that’s visible through the bar window as well as from every outside angle is the eponymous Lumpy Ridge. As per usual, my amateurish cell phone photos do little justice to the wonderful mountain views that are inescapable no matter where you stand/sit around Lumpy Ridge Brewing. Furthermore, our service was excellent and their rye pale ale beer had a wonderful bread-iness that even my obliterated taste buds thoroughly enjoyed. If you’re a fan of Fat Tire then this is like the 5 star version of that 3 star beer. Once more with feeling: Lumpy Ridge Brewing Company is AWESOME. Plan a visit to Rocky Mountain National Park just so you can drag your family up to this brewery, then spend a few minutes in the national park as an afterthought."